Why Would You Want a Golf Mat? In a perfect world, it would always be possible to practice golf on grass. Golf is played on grass, of course, so practicing on grass is the best way to prepare your game for what you will encounter on the course. Unfortunately, that is not always going to be possible. Many golf facilities today offer mats for practice rather than a grass tee line, as mats don’t require maintenance and are relatively cheap to replace. Along those same lines, if you would like to practice golf at home, you will be far better served to purchase a mat rather than trying to maintain a patch of grass to satisfy your golf habit. For most of us, it simply isn’t possible to spend all day at the golf course. 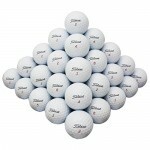 As much as you might like to work on your game all day long, other responsibilities get in the way of that goal. So, in order to balance real life with the improvement of your golf game, it is a great idea to set up a practice area at home. By working on your swing for just a few minutes at a time while at home, you can be that much more prepared for your next round when you return to the course. The great thing about owning a golf mat is that you can use mats both indoors and outdoors, depending on your needs. If you have a big garage with room for a hitting net, you can set your mat up and practice all night long. Or, if you have a big yard and good weather, you can set up a net outside and practice in the sunshine. Either way, having a mat on hand at home will make it far easier to work on your swing anytime you have a few minutes free. Of course, you don’t just want to place an order for the first golf mat you find online, as various models have different features, levels of quality, price points, and more. To get started on the right foot in your search for a golf mat, please check out the six options below. The first mat on our list is an affordable, compact option from Truedays. Unlike the mats that you will use when you head to the average driving range, you don’t actually stand on this mat while swinging. 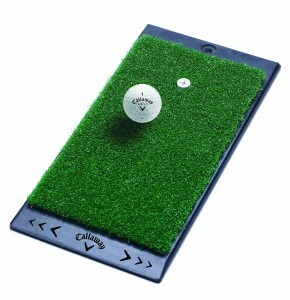 Measuring just 12’’ x 24’’, this mat is designed for you to stand off to the side while hitting your shots. There is a rubber tee included with your purchase, and the rubber backing on the mat prevents it from slipping as you swing through impact. Often available for less than $20, this is a great pick if you are looking for an affordable mat to get started in the world of at-home practice. 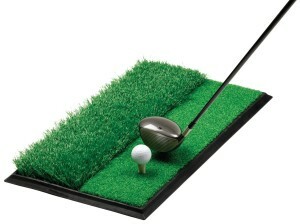 Our next product is a larger mat, similar to what you would find at your local driving range. This product is offered by All Turf Mats, and it measures 3’ x 5’. The woven nylon turf that you will be hitting from is ½’’ thick, and there is a foam backing on the mat which is intended to keep it in place as you practice. As usual, a rubber tee is included with this mat. While this full-size mat is more expensive than the smaller option listed above, it is still relatively affordable, as it is usually offered for under $70. Back to another small mat, this Callaway product is even more compact than the mat which led off our list. At only 8’’ x 16’’, this item is perfect for the golfer who needs to save as much space as possible when assembling a home practice area. 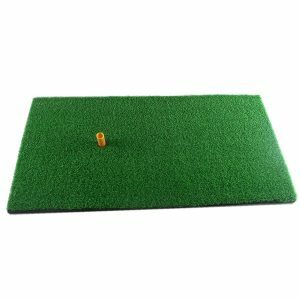 One of the nice features of this mat is the patented tee holder that is set into the mat – rather than hitting from a rubber tee, you place a traditional golf tee into the tee holder. As you might expect from a brand name like Callaway, this mat offers a high quality construction, meaning you can count on it to hold up as the months and years go by. Bringing another new option to our list is Jef World of Golf, who offers a mat which features the ability to hit from both fairway and rough lies. Measuring 1’ x 2’, half of this mat is covered in a short synthetic turf, while the other half is covered by longer ‘grass’. To make sure you are able to dial in just the right tee height to practice your driver shots, three different rubber tees are included with your purchase. At this point in our list, we find a unique option from Rukket Sports. Rather than offering two different types of imitation grass for your practice sessions, as with the mat above, this product has three different levels to hit from. 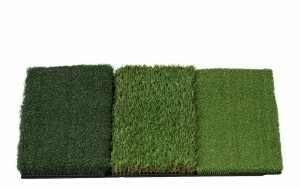 It is a small mat at just 25’’ x 16’’, yet it manages to fit in three various heights of synthetic grass. There is a clean lie option, a short rough option, and a ‘tee turf’ option, which allows you to stick your real golf tee right in the mat. Since the tee turf makes it possible to use your own tees, there is no rubber tee included with this product. To finish up our list, we find another mat from All Turf Mats. This is the most expensive option we have presented – usually over $100 – but it also is the largest at 4’ x 5’. You will obviously be able to stand on this mat as you practice, and you can even use a traditional wooden tee as the tee will stand straight up when pushed into the mat. There is also plenty of durability to be had here for your money, as the mat is a full 1.25’’ thick, and it has a urethane backing. If you are someone who is going to be practicing at home on a frequent basis, investing in a quality mat is a wise decision.